Right now, the sun is beginning to set over the waters of Liguria, my future home as of 4 March. I am traveling back to Maremma for a few more precious days of language lessons and time with Virginia and her family. Believe me, I need the lessons, and, frankly I enjoy Virginia and her family very much. But this week was all about my family. Here we are, clowning around. That’s my big mouth wide open, my granddaughter, Maggie is in the middle, la mia nipote, e mia Figlia, and my daughter, Stephanie. This is how it all usually starts. Silly pants, that is what we can be when we are together. Steph and Maggie arrived on 21 February at the Milan Malpensa airport. They had found a well-priced, week-long trip including air, hotels and car. I don’t think my daughter slept much on the airplane. Driving to Montecatini for their 1st hotel was a bit of a nightmare. I am glad she pulled over for a power nap. M (Maggie’s nickname) slept most of the way. I was waiting for them at the hotel. We hugged, kissed and got right down to silliness. Then we walked the area looking for a good restaurant. We found a local place and each enjoyed our meals and the company. Then it was off to sleep. Or so we thought. M decided that sleep was optional. Her mother was not amused. Still, jet lag hits us all in different ways. She could do nothing. The next day, we tried to take it slowly. We visited the Merry-go-round before it opened. M still enjoyed spinning even without the movement of the carousel. Steph has an Italian friend named Stefano who joined us for a few hours. We all took a Ferris Wheel ride together. Did I mention that it was about 50 degrees F. and windy? Maggie also posed with Puccini. After another fabulous dinner and saying ci vediamo, Stefano, see you later, Stefano, we tried to sleep once more. Stephanie didn’t do so well. Neither did M. And we were heading for the Chianti region the next morning. VALLONE DI CECIONE WINERY, a completely organic winery with a long history. Their grapes grow in the valley called The Valley of Gold because the terroir, the earth itself, feeds all growing things so well. Not only did we taste wine, we enjoyed several courses of food with Francesco and his parents. It was fabulous. We moved onto pasta, of course, and another wine. More wine, and the second course of wild boar (and it was delicious). I am sure I forgot some of the food but here are the different wines we enjoyed. Note the photo labels on each bottle. They are family photos and, the Rosato di Allegra wine was named after Francesco’s daughter. There was also homemade Vin Santo. We enjoyed the passion of this family and we tasted it in every sip of the wine. Sharing a meal with the family was priceless too. Well, we did buy some wine but that was a bonus! Next, we visited Nora’s goat farm where M could frolic with the wild things. Maggie found that she preferred the dogs. The Capre, goats, wondered why. After shopping in their store and touring the grounds, it was time for a leisurely drive with Arianna and Alessio back to San Casciano where we parked our car. Then we had the long drive back to Montecatini. Again, my daughter did not sleep much that night. Early the next day we caught the train to Florence, my favorite town in Italy. I so wanted to share it with my girls. We visited DAVID by Michelangelo. Maggie wanted to see him, understand how he was made, who he was, and why he was naked. She also explored every painting and sculpture in the Accademia. Steph, of course, loves the art and wanted her child to share this experience. I found Maggie’s curiosity so enthralling. She is like her mom, bright, curious, and open to new experiences. Her favorite experience in Florence was the Gelato. We finished our day with a sunset on the Arno and a long walk back to the train station. Another night with little sleep. And Friday we were off to meet with our cugini, cousins, who live in La Spezia and Massa. 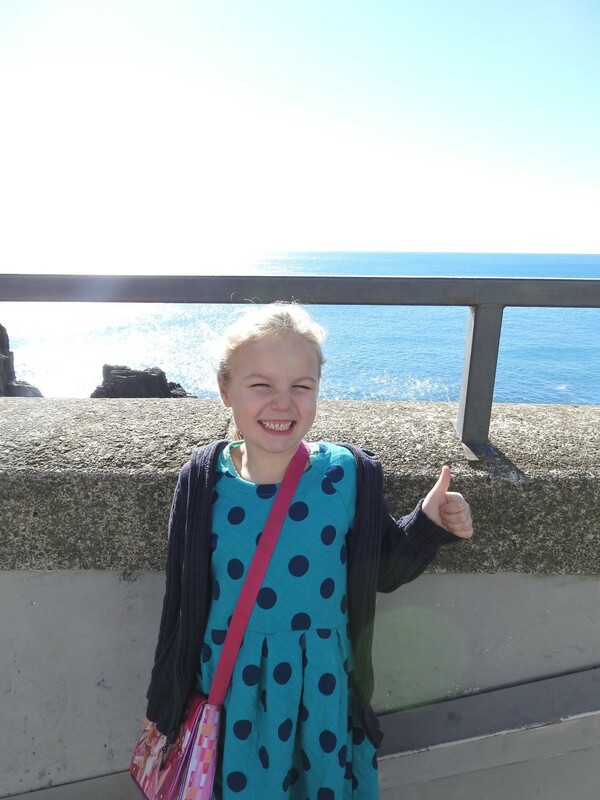 Stephanie also wanted M to experience Cinque Terre and enjoy it as much as she did. Cousin Rosa and her husband Michele hosted us in their home. We spoke Italian nearly all the time. Stephanie knows Spanish well and studied a bit of Italian too. Maggie knows a few words. I know more but am far from fluent. Still the love we feel for each other minimizes our language shortcomings. We had a wonderful pasta lunch and headed off to Riomaggiore by train. Maggie loved it from the moment she left the train. We all enjoyed the sun and the water. I even enjoyed the walking. There were hardly any people there as it is off-season. We loved it. But, we loved the beach even more. And throwing rocks into the water. And just sitting by the waves. We tore ourselves away and visited Vernazza too. M took the photo above. She is 6 years old. More water, more sun, more colorful buildings and a hunt for chocolate surprise eggs by Kinder. Maggie loves them. And we enjoy watching her break them open and play with the toys inside. She prefers the toys to the Chocolate. I wish I could say the same. For our dinner that night, more family members joined us. Giulia, Michele and Rosa’s daughter, her friend, Luca, and my long-lost cousin Ettore Cucchiarella and his wife Maria. 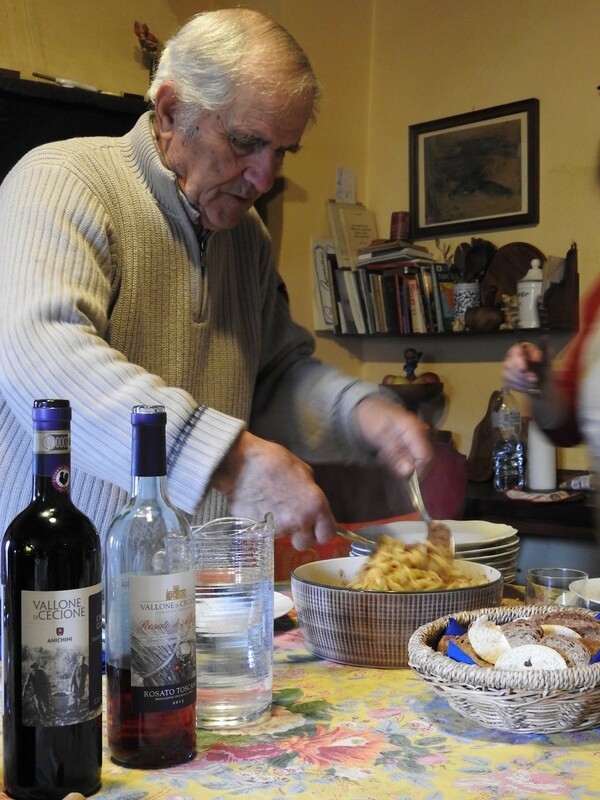 I met Ettore 43 years ago on a bus from Benevento to Fragneto L’Abate, our family home. My husband and I were wearing backpacks. He was blond and very Scandinavian. He stood out. So did our backpacks. I asked a man if he knew anyone from our family. He laughed and hugged me and said we were cousins. That was the beginning of my encounters with my Ricci family in Italy. I have wanted to see him again for so long. Here we are. It was such a wonderful experience. I know we will see more of each other. We will be living close by one another too. Un’abbracione a Tutti. The following afternoon, we said our goodbyes to our cousins and headed to the hotel in Milan. It was our last night together. It was such a strange feeling, knowing I would not see my girls again for months, maybe years. Her work keeps her busy in Seattle. Maggie has new friends in Seattle too. I wish they would move to the EU as I have. Even if they were not in Italy, we could see each other more easily. They love Italy. But they have their own lives. I am not sure that I can stay this far away from them. I will do it this year. And we will see what happens. I am on my own adventure. They are on theirs. I wish it could be easier to be together. When we said our farewells early this morning, Maggie teased me because I always cry when I say goodbye. My daughter told M, “Don’t worry. It’s just her thing.” It is my thing. I cry. I know how unpredictable life can be. But for now, I am just treasuring the moments we shared this week. I am replaying the joy my daughter felt in Chianti and in Cinque Terre. I am recalling how M ran up and down the steep walkway to Rosa’s house and how she laughed. Or how she sat quietly, tossing rocks into the sea. Or when she was laughing with her Nonna. What a week with my girls! They are flying home right now while I am on the train to Maremma. And I finally have keys to an apartment in Chiavari. I hope they come back to visit. I have room for them always.